Drones! They’re everywhere buzzing overhead at big events like oversized bumblebees, snapping away breathtaking aerial shots and making even an open house turn into Hollywood-style cinematic epicness. But before you transform your wedding video into a Michael Bay production, consider a few things first about who to hire and what technology to use. Fasten your seat belts, please, we are about to take off. 1. Spectacular and Unique Photos- Guaranteed! As you may know, drones are unmanned aerial vehicles (UAVs) equipped with high-resolution cameras. Before the advent of drones, you would’ve needed a nearly limitless budget to rent a helicopter and aerial photographer to capture shots that didn’t even compare to what these tiny robots can shoot today. Drones have forever changed the landscape of aerial photography and our wedding day expectations. With a drone, you can capture the entirety of that beautiful estate, rustic barn, or gorgeous garden setting of your wedding day. Amazing and unique photos of a happy couple? Rare or random photos? The tide coming in as a part of your wedding dress shots? Guests in heart formation? The possibilities are really limited only to your imagination. If you’re going to utilize a professional aerial photographer (and yes, we said professional, read our next tip for why that’s important) you’ll want to brainstorm the types of shots you want captured. Do you want your guests to form a certain shape related to your theme? Is there a surprise or big moment you want to see from above? Write it all out and share it with your photographers. Nowadays we all seem to have a friend or cousin with a drone they won at the work holiday party. That’s great for borrowing it to play around with, but just like you’re not trusting an amateur friend of a friend for your wedding photos (tell us you’re not, please) you don’t want to do that either with your aerial photos. For one thing: liability — yep, things can go wrong, a drone can fall or hit someone or something. Not that there’s a large chance of this happening, they are indeed quite safe, but it’s the reason professionals have training and insurance. Many also specialize in wedding day shoots, so they’re going to know the right ways to get the shots you want. Like any other vendor you choose, you’re going to want to read reviews, check out their work and interview a few before deciding on a vendor. Many photographers and videographers offer drones as an add-on, rather than a standalone booking. Which means if you’ve already chosen your photographer or videographer, you should ask them first if they offer this option. Prices vary, but you should set aside at least an additional $1,000 if you want drone photography. 3. All Clear to Fly? Okay so even though you planned out the perfect drone shots and picked a pro, don’t be disappointed if the drone isn’t allowed to fly due to weather conditions. Add drone shots to one more reason to pray for clear blue skies on your wedding day. Sadly most aren’t going to fly if it is raining, snowing or there’s high winds, which can also ground the tiny flyer. If you’re having an outdoor wedding, you’re already planning for every possible weather scenario though, right? Drones are just one more part of this variable. 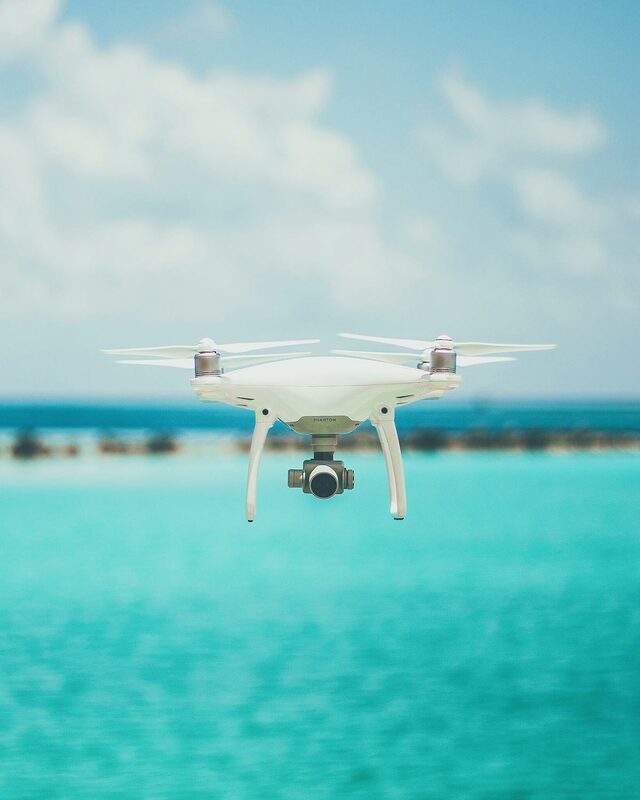 Fun fact: Drones aren’t just for outdoor weddings! Who would’ve guessed. But if you’re going to fly them indoors, you’re going to need very high ceiling. So keep this in mind. Also remember, drones are noisy. You aren’t going to want a drone inside, no matter how high the ceilings, sounding like a power fan during your vows. But if your reception space has high ceilings (and is okay with drones inside — yes, you need to get their permission) then a drone flying around the dance party might be fabulous. One idea, if you’re holding most of your wedding day inside: many times wedding parties go to a local park or garden to capture some outdoor shots in a gorgeous setting. This can be a great time to work in some drone shots, without having to risk a drone inside. Drones aren’t just flying around willy nilly on their own, there’s an operator, an experienced aerial photographer behind them. To get the most out of you moments, you want that photographer aware of the lay of the land and the exact order of activities at the location. This way they’ll have the drone ready to capture those impromptu moments and staged shots perfectly. If you are using a separate drone photographer outside of your main photographer’s company, definitely get them talking several weeks beforehand, so they’ll be able to work together. Capturing multiple angles of the same shot can make for awesome video.